With the support of USAID LENS and CIPE, the King Abdullah II Center for Excellence is incorporating new curricula into its training services to promote organizational excellence among Jordanian business associations. KACE trainers (seated) at a USAID LENS supported training-of-trainers workshop, implemented by CIPE, introducing new curricula on business association management customized for Jordan. Micro and small enterprises (MSEs) are an important component of the Jordanian economy, creating jobs and prosperity in communities throughout the country. These enterprises face significant challenges, however. A lack of business skills and networks, and limited access to finance, are just some of the hurdles MSE owners face when starting and growing their business. Business associations play a vital role in providing support to these business owners, helping them fill the gaps in knowledge and contacts that stand in the way of their success. 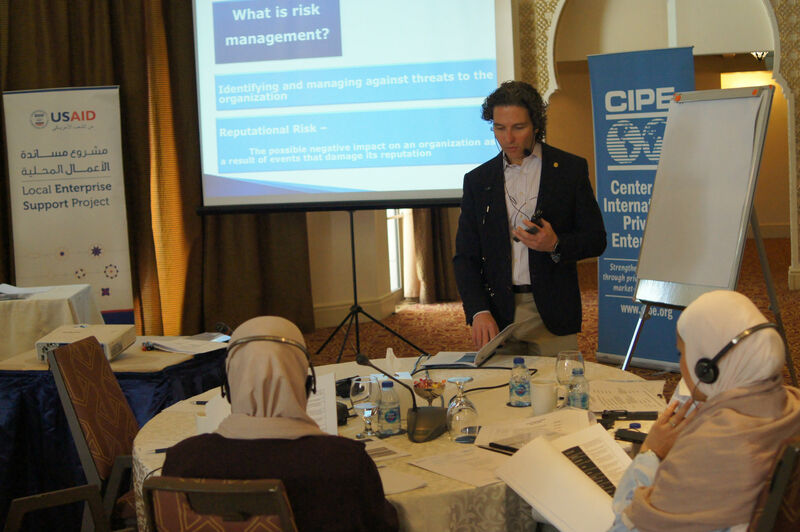 The Center for International Private Enterprise (CIPE) has been working with 11 business associations in Jordan to help improve their capacity to provide much needed support to their micro and small enterprise members. Through a comprehensive program, CIPE helped its partner associations develop the strategic planning, financial management, and member outreach capacity that underpin their ability to deliver support services to members. CIPE’s work in Jordan is made possible through a partnership with the Local Enterprise Support Project funded by USAID Jordan. 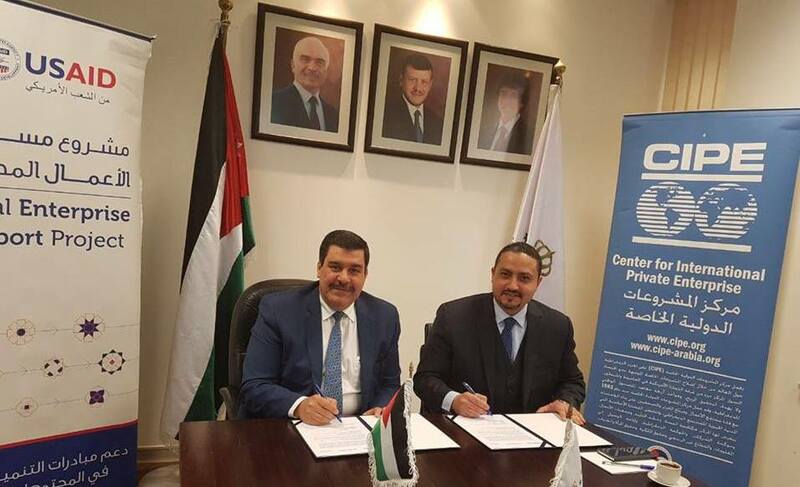 With this aim in mind, CIPE partnered with the King Abdullah II Center for Excellence (KACE) to enhance the quality management system for business associations in Jordan. Founded in 2006, KACE’s awards for excellence are considered the most prestigious quality management recognition across all sectors in Jordan. Under the partnership, CIPE will support the participation of a number of business associations in KACE’s European Foundation for Quality Management (EFQM) “Commitment to Excellence” program. Assessments conducted through the program will encourage further organizational improvements and identify future goals. In addition, CIPE developed organizational excellence curricula customized for business associations to be incorporated into KACE’s repertoire of training programs. KACE trainers providing input to the business association excellence training curricula CIPE developed for their use. 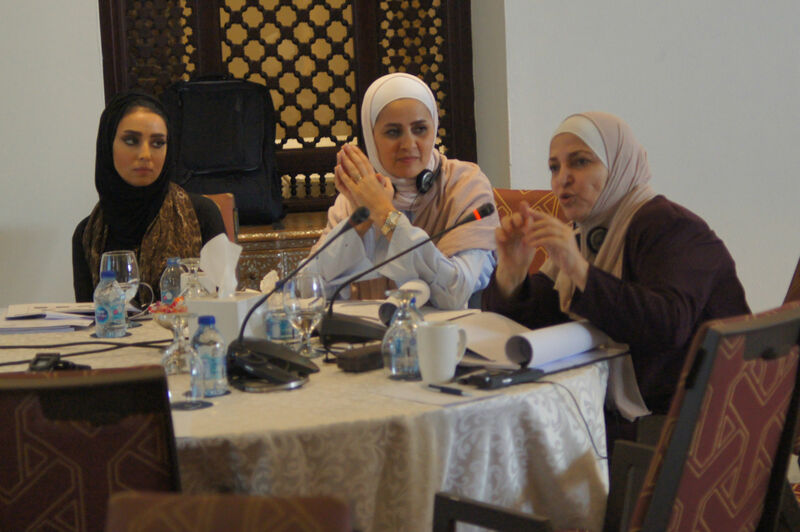 Input from Jordanian trainers helped CIPE optimize the curricula for the Jordanian context. Jordan’s business associations are an essential element of the country’s entrepreneurship ecosystem. The new KACE program will help the associations continue to develop their capacity to provide the services Jordanian MSEs need to be resilient and competitive.